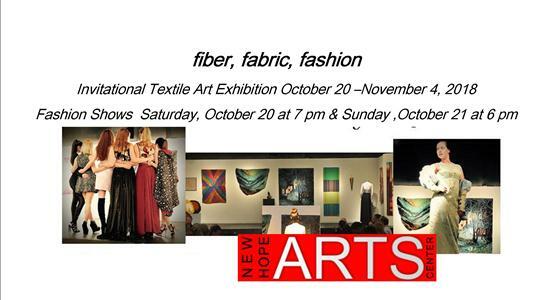 New Hope Arts' unique exhibition of textile arts, now in its 3rd year, provides an excellent opportunity for sponsor exposure to a wide audience. Reach more than 500+ exhibition viewers attending the Fiber, Fabric, Fashion Exhibition and Fashion Show from October 20th - November 4th. This popular invitational event offers an exploration of original and repurposed techniques in fiber & fashion, showcasing wearables, couture, and fiber arts including a curated collection of work by established and emerging designers and artists. The opening event is a runway fashion show, a ticketed event, which brings about 200+ people into the gallery over two sessions, Saturday Oct 20th & Sunday Oct 21st,. The fiber arts and fashion exhibition continues through Sunday November 4th. NHArt’s program book features participating artists, designers and models. Your sponsorship of FFF includes an ad in the fashion show program book, sponsor credit on the promotional banners and posters as well as sponsor identification in our press releases. It's a great way to participate and showcase your business in New Hope and the region and to support our mission to serve the arts and artists of our community. We invite your sponsorship at the $100, $250 and $500 levels. New Hope Arts is a 501(c)3 entity .